After a hard days work, the cowboys head out for the Honky-Tonk (a western bar. The old name would be Saloon). There, they submerse themselves in bourbon, country music and a bit of dance. The melody is easy to follow, and the words are even better. As the drum pounds out the rhythmic beat, sometimes it's rock, sometimes it's pop, though it also has it's share of slow songs. I am sure that if you lend it an ear, you will ask "This is country?" True country music has not seen much popularity here in Japan. Many seem to confuse country music with the musical score of an old western or other type of music. When I go to a near-by CD shop, they always have several selections of CD's titled "20 Best Country Songs." Though these are in fact great songs, there are the oldies of country music. Country music is a modern, popular form of music. I hope many will take a moment to listen to modern country music. If you ever venture into an American country bar, they always seem to have a large dance floor where many enjoy dancing to the latest country tune which fills the air. On the weekends, the bars become packed to the brim with cowboys and cowgirls. 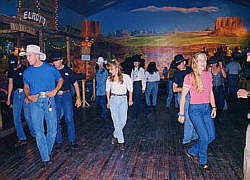 There are two types of dances that are done at country bars; couple dances and line dances. These dances differ completely from the square-dancing you may have learned in elementary school. Couple dances pairs a man and a woman together, and looks a lot like other social dances, but you can relax a lot more when dancing. The 'two-step' is the most popularform of this kind of dancing. It's a simple step, and once you learn it, you can dance with any cowgirl (if your a cowgirl, than with any cowboy) in the U.S.
Line Dancing is so-called because many people form a line to do the same dance, but it is not the French Can Can. There are numerous different dances that can be performed, and each has it's own name. The Electric Slide and the Tush Push are very popular, and if you know these two, you should have an opportunity to do them sometime in the U.S.
Country dancing is for having fun. You shouldn't worry about whether you look bad or are off rhythm, just dance. It may seem hard to learn at first, but once you learn it, you just can't seem to stop. It's enjoyable to just sit and watch the people impressively dance around the floor, but you should try it your self also. Live-houses and even culture schools are places where you can learn to dance in Japan. Where can I listen to Country Music? The Armed Forces Network (AFN) features programs for the U.S. forces, and of course plays country music as well. The station also features the Country Countdown. Most KFC stores play country music in their establishments. Some play Japanese Pop music, but most play country. You may be unaware you were listening to country music. Lately, it is not uncommon to hear country as the background music of a television commercial. Though few people probably realize it is country music. Live performances are nothing less than fun. Many country singers are active in Japan, and you can give them a listen by going to a bar which has live acts. The price is fairly reasonable. However, please note that a music fee of around 1500 to 2500 yen will be added to the tab for every person in your party. At 'Kickin' Country' located here, you can scarf-down some chicken while you view a musical review show of the latest country tunes. It's enjoyable for everyone, and not just the country music fan. You can even get some instruction on country dancing. (I apologize if this has changed). Do not underestimate Disneyland, all of their dances are the latest thing around. Occasionally there are country events held in Japan. You are sure to enjoy yourself should you go. Country fans from all over the nation come to these events. Those which wear western cloths in a mistaken manner, those who love country beyond everything else, those who love to dance, and many others. Just sitting back and watching the crowd is an enjoyment. Held every October in Aso, on Kyushu, 'Country Gold' is the largest country event in the nation. Where can I View / Participate in Country Dancing? The best way to get started in country dancing is to visit a live-house. There are quite a few places in Japan that may make you think you have gone to the U.S. Any number of cowboys and cowgirls pack the place and indulge in dance. Don't hesitate to enter. Just go in like you would any other bar or restaurant. However, any place featuring a live band is sure to chare a music fee of 1500 to 2500 yen to your tab for every person in your party. If, after watching a while, you find yourself wanting to get up and join those dancing, just get in line and follow along. It is not easy to follow, but that it self can be fun. There is nothing to be embarrased about. Everybody learns that way. If you should ask someone who is dancing along, they will most likely give you kind instruction also. Want to dance, but too embarrassed to go to a live-house right away? Want to learn slowly and quietly? Then maybe a country dance school is more for you. Many schools operate all over the country, and they will give you kind instruction on how to do each step. It is also a good place to make friends with other cowboys & cowgirls. There are many places other than culture schools which will teach you. Dancing Texas led by Ms. Natsuko Grace, hold dancing classes at many cultural schools in and around the capitol, Tokyo. Please see Schools. There are many instructional videos in the U.S., but there are also videos in Japanese in Japan! At the show held in 'Kickn' Country' located in here, there is a section where they invite people from the crowd up onto the stage (I apologize if this has changed) and instruct them in country dances. Links << For Further Information on Country Music and Country Dance see Here! Copyright © 1997-1998 Real Western All Rights Reserved.